There are a couple ways you can get your Silver Paw Puppy. You can come to our home or have your puppy shipped, which can include the puppy shipping in cargo, or you flying with the puppy in the cabin. We love when people pick up their puppy in person! We are located 20 minutes south of Spokane on well maintained roads. You should be able to get to us in any weather conditions. We ask that you do not visit other kennels or dog breeders before coming to our home. We will also ask you to leave your dog in your vehicle if you bring him/her when you visit. 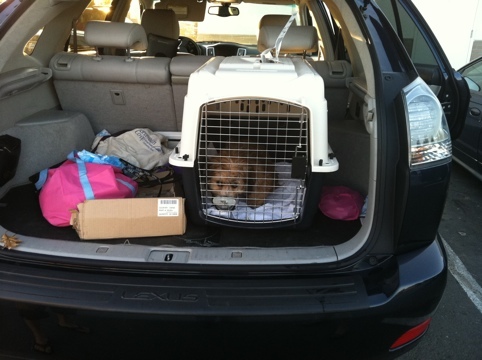 If you plan to travel with your puppy in the car, you should be prepared with a few things. Ideally, you will bring a potty box or potty pad and set it up in the back of your vehicle or in the trunk. Your puppy will most likely let you know if he needs to potty, and you can quickly pull over, take him out of the crate, and set him in the litter box. If he is less than 13 weeks old, he has not had all of his shots and he is NOT SAFE from puppy diseases. We do not want your puppy to pick up anything on his trip home, so he must eliminate inside of your vehicle. Having the potty box or potty pads will make this process the easiest because your puppy is familiar with this as his toilet. We check Alaska Airlines first to ship your puppy. If this is not possible, we use Delta or United. We ultimately will decide on the flight and time for shipping the puppy, and the safety of the puppy will always come first in our decision. Please check the Alaska Airlines Destinations Page to let us know which airport is closest to your home. 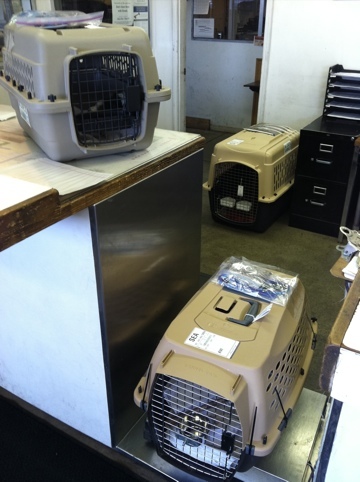 Most of the puppies will ship out of Spokane, WA, and route through Seattle, WA, and on to their final destination. For some puppies going to the East Coast, we are unable to make the connection in Seattle, and this requires us to consider other airlines. We have found Alaska Airlines to be safe and reliable, and competetively priced. 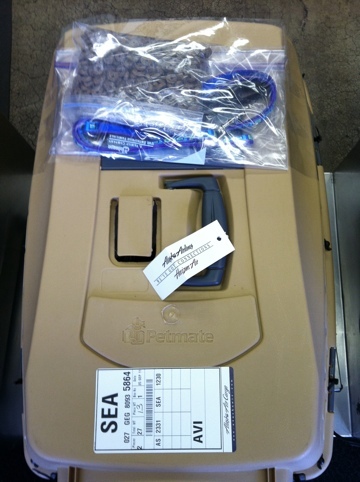 Your puppy will come in a Petmate Travel Crate that is bolted on each corner. There will be a divided food/water dish attached to the inside of the crate door. The puppy will travel on a new white towel with the smells of home on it. You will want to bring something to put inside the crate once your puppy arrives. He may have gone potty and you will want to clean that out before driving home. Remember to hold the puppy and do not put him down on the ground at the airport, or anywhere else while you freshen up his crate. On the top of the crate, you will find a ziplock bag taped with packing tape. This will have your puppy’s food, blankie with the smells of home, shot record, and the Lupine collar & leash. 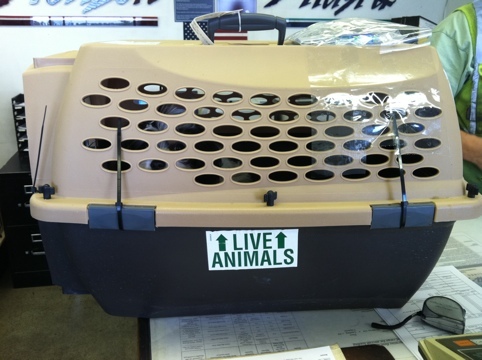 There will also be a large envelope taped to the outside of the crate which will have your puppy’s Health Certificate and any other paperwork from the airlines. The puppies have to be checked in at the airport two hours prior to the plane taking off. They are checked by TSA and then loaded onto the airplane shortly before it takes off. Alaska Airlines has a special cargo hold for the animals. This space is heated or cooled the same as the passenger cabin, and pressurized, and the only difference is that once the doors are closed, there are no lights on. You can take your puppy out of the crate to freshen it up, give him hugs, and receive his puppy kisses! Remember, he cannot go on the ground at the airport unless he is an Accelerated puppy who has had 3 sets of shots already. 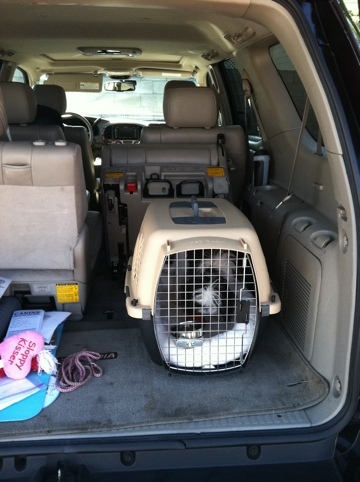 We have had several families that chose to fly into Spokane so their puppy could ride back with them in the cabin. We are happy to meet you at the airport to make this happen. It is often a two day adventure, flying in one day, staying in a local hotel (you simply walk across the non-busy road to the hotels), and then fly back the next day with the puppy. In some cases, families have been able to do both legs of the trip on the same day. 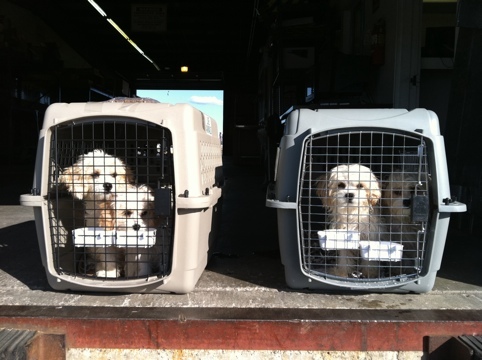 I have flown with puppies in the cabin several times and it has always gone smoothly. They generally curl up and sleep the entire trip until the plane lands. This usually wakes the puppy up, and he will need to go potty. This is the toughest part of the trip because you will not be able to let him out of his carrier. He may be noisy until he finally does his business. You will want to have extra potty pads and baby wipes to clean up any messes. It’s handy to bring a plastic grocery bag for quick disposal as well. You should have a litter box in your vehicle for your drive home, and refer to the section above about driving with your puppy.